Nothing is more fundamental to living than breathing. But just because you've been doing it all your life doesn't mean you can't do it better. Breathing well is also central to meditation, relaxation and other practices that slow down the aging process and feel great while you're doing it. Expanding on the life-extending program introduced in YOU: Staying Young, Drs. 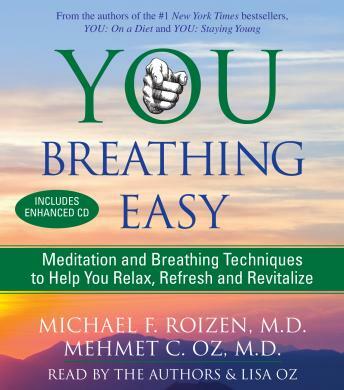 Michael Roizen and Mehmet Oz bring you an audio program designed to help you enjoy all the physical, mental and spiritual benefits that come from truly breathing easy. On Disc One, Drs. Roizen and Oz tell you how to focus on breathing to make it work for you. You'll learn how your breathing apparatus works, and how the breath of life moves through your body and affects your well-being. You'll explore the science of stress and discover how to identify stressors and reduce their effects. You'll also learn how to improve the significant part of your life you spend sleeping, and why it's so important to your overall health picture. We'll also help you open the YOU Toolbox for insights into medical tests, vitamins and supplements and other information vital to the rich, vibrant life of breathing easy. Whether you're just learning how to meditate or refining your technique, breathing and meditation are among your most powerful tools for repairing your body and fighting the effects of aging. Make healthy breathing a habit for life with YOU: Breathing Easy.